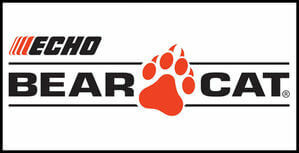 Bear Cat is manufactured and designed by the well known and well back Echo. This walk behind brushcutter features three variable speeds making it ideal for larger areas. This WT190S trimmer comes standard with .155mil nylon cutting line that is both strong and durable. Allowing you to cut almost everything without having to change the line over every 3 minutes. This Bear Cat Walk Behind trimmer can also be fitted with a triple blade cutter and sabre tooth blade kits which can cut sapling and small trees up to 4" in diameter. Echo Bear Cat wheeled trimmer can be used continuously on a slop not exceeding 15 degrees and can operate limitedly on slopes greater than 15 degrees. The plastic trimmer line will outlast any ordinary trimmer line you may use or see although hitting saplings or harder objects will reduce their life. Sabre Tooth Blade is designed for cutting small tress, saplings and bushes up to 4" in diameter. The Triple Blade Brush Cutter is designed for the heaviest grass, weeds and bush growth, and it can also be sharpened to extend its growth.